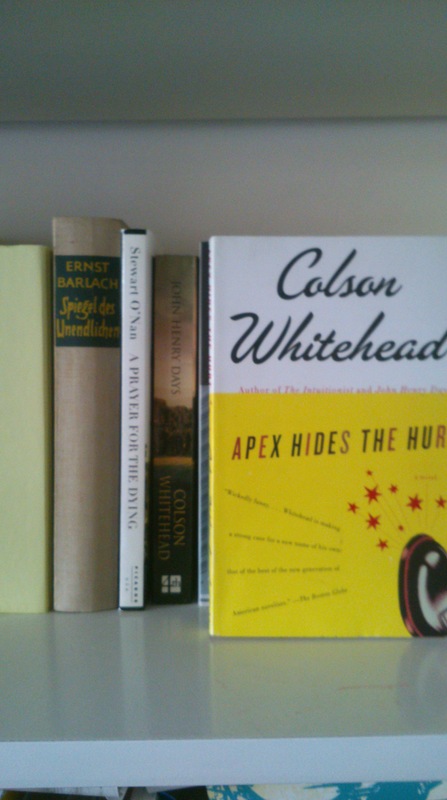 Colson Whitehead: Apex Hides The Hurt | shigekuni. 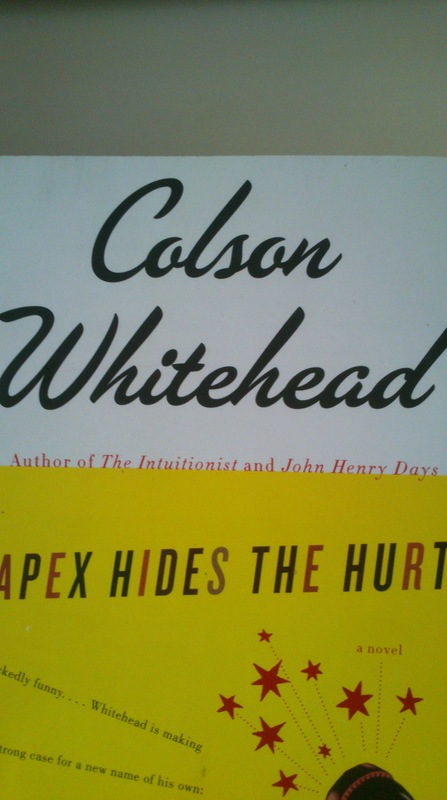 Although all of Whitehead’s books seem to be genre bastards, Apex Hides The Hurt is difficult to categorize even by Whitehead’s standards. This is both a weakness and a strength of this novel. On the one hand, the book is so well written, so well structured, so intelligently built that it’s hard not to be awed by Whitehead’s capabilities as a writer. 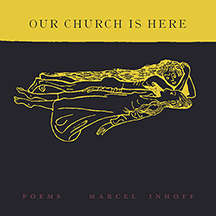 There is nothing that escapes his eye, no detail, word, turn of phrase left unattended, the whole book is like a finely crafted work of art, that uses genre as one of many tools to give his ideas shape and form. On the other hand, Whitehead has, for whatever reason, forgotten the story, the life, an energy that is not cerebral, something that moves the reader through the story. In this book. Whitehead turns out to be a bit of a solipsist. In my last review I mentioned that some writers are supervising their readers. Well, the author of Apex Hides The Hurt seems barely aware that he has any readers. 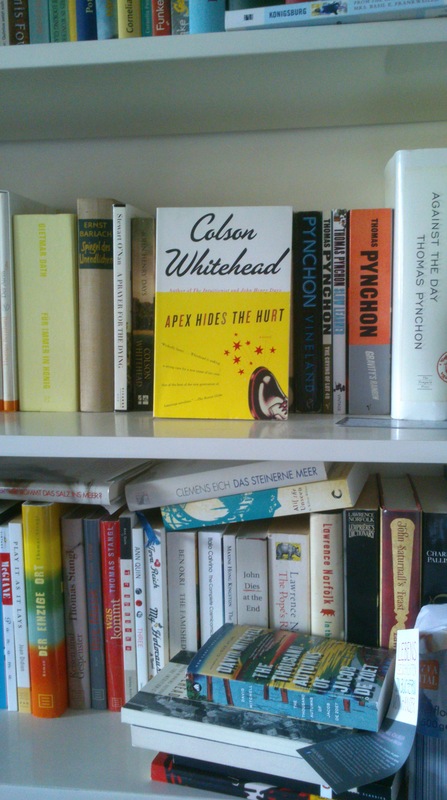 There are several attempts at building a story, three kinds of suspense built in, but Whitehead is not able or willing to follow through on one of them and fashion the necessary drive for his book. His meddling with genres is one of the reasons why that’s the case. 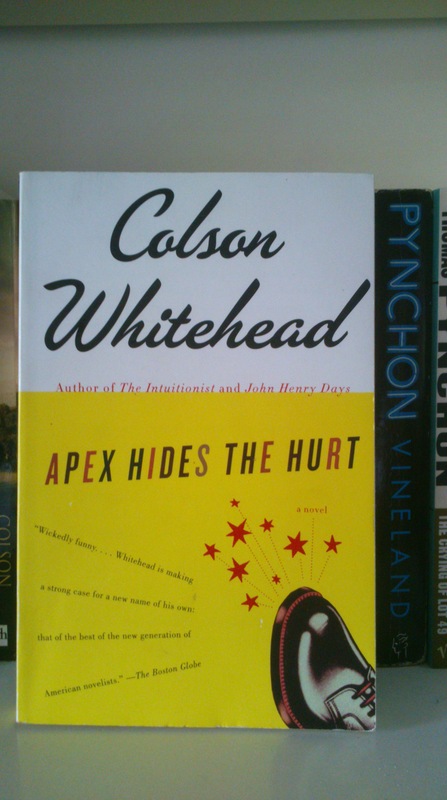 Apex Hides The Hurt shares many of the characteristics of his debut novel; The Intuitionist, however, had a noir-ish mystery plot to hold on to while Whitehead wielded his ideas and concepts. There is none of this here. This is not to say that this novel is utterly devoid of suspense. In a sly manner, Whitehead withholds two kinds of information from us, both of which create a mild suspense. These two kinds of information come at the end of the two narrative strands that are intertwined in the book. One is taking place in the present, charting the nameless protagonist’s arrival in a town called Winthrop. He has been hired by the town’s council to advise them in the matter of re-naming the town. Why they would hire him is revealed in the second strand. The protagonist is a nomenclature consultant, that is, he’s someone who is paid to give a name to products, people, campaigns, and he is naturally gifted at what he does. In this second strand we follow his career to its end. And here we have the two kinds of information withheld from us. The future name of the town is the first: not until the last pages are we apprised of the name that the protagonist chooses for the town; the second is this: although, in the narrative that takes place in the present, we are told that his career has abruptly ended, it is not until the end of the book that we find out why. For good measure, Whitehead throws in a few thriller elements, as his protagonist digs through the town’s history and discovers long lost secrets. These three kinds of suspense (name, reason, archive), however, are pursued halfheartedly; Whitehead constantly saps the energy, the blood, from the book by turning every potentially riveting element into yet another spire in his construction. It’s amazing how much disinterest he displays in these parts of the construction of a novel. Despite all I said, the novel, make no mistake, is still a great read and it still draws you in, but it does so solely on the basis of his ideas, his commitments and his writing, not because of the plot or even the flimsy characters. None of the characters in Apex Hides The Hurt exist because of exigencies of the plot, or because the psychology of one of the characters demanded it, every single character can be read to “stand for” something. In the narrative that takes place in the present, we have the trinity represented in the town council: there’s Regina Goode, the town mayor, a direct descendant from one of the two founders of the town (named Goode and Field). She wants to change the town’s name to its original name, Freedom. There’s Lucky Aberdeen, a successful entrepreneur who wants the town to be named in a snappy and attractive way that will pull business to the town, the name he came up with is New Prospera. And then there’s Albie, the slightly mad last scion of the Winthrop family, who wants to retain the town’s name. His family originally pressured the founders into changing the name in the first place. The Winthrop family had a very successful barbed wire business and the town that was called Freedom paid with its name for the opportunities that having the business settle there would have afforded them. Clearly, the situation thus mapped out contains a wealth of ideas. Most directly, perhaps, ideas that pertain to American history. See, as it happens, Goode and Field were freed slaves, so the fact that they founded a town and called it Freedom is interesting; even more so when considering that the town of Winthrop, as the protagonist encounters it, is predominantly white and Regina Goode the first black mayor in ages. Additionally, no reader will be able to refrain from associating the name of “Winthrop” with the most famous Winthrop of early American history, John Winthrop, founder of the Massachusetts Bay Colony, who was immortalized in Hawthorne’s searing masterpiece The Scarlet Letter. Winthrop is a dominant figure in Apex Hides The Hurt, although always somewhat indirectly. There are a few way that the historical Winthrop ties into the novel. One of the ways is through the city of Winthrop, Mass, a town that is actually named for the governor. In Apex Hides The Hurt, there is a fictional university that is clearly supposed to be Harvard, but is called “Quincy”. Is it a coincidence that, at the other end of the Massachusetts Bay, there is another small town called Quincy? Quincy is the more famous town of the two, being the city where John Adams, John Quincy Adams and John Hancock were born, thus, when Albie exclaims “But then Lucky told me you were a Quincy man, and I knew I would get a fair shake. A Quincy man is a man of his word.”, it takes on a wider significance. Now, I realize that this is a lot to infer from just the two names “Winthrop” and “Quincy”, because “there are a lot of rich white people named Winthrop”, but, as Whitehead goes on to say, “with names there is no coincidence.” So, to sum up, Whitehead presents to us both slavery, and a rough sketch of the black political experience in the US, as well as the man who first legalized slavery in the Colonies and was part of quite a few developments that shaped the United States and still do. It’s not, however, a small-scale depiction of American history, since the chronological order is mixed up. But in Apex Hides The Hurt references are always a bit slanted. Another reference to John Winthrop might, for example, be through the title, which is a brand name our protagonist came up with for a cheap line of adhesive bandages and the slogan that accompanies it. It’s hard not to associate “Apex” (you are not told, until you’re a good deal into the book, what the title of the book actually means) with John Winthrop and his phrase “city upon a hill” (from his sermon “A Model of Christian Clarity”), that has long since become part of the American self-image, and it is indeed to Winthrop, this city, this destination that the protagonist comes and where, in a sense, his new life begins. This city seems to carry a certain promise for him, as it had for Goode and Field. He has never led a life that demanded choices, struggles of him, this changes in the town of Winthrop. The choice of a name that he’s been asked to make, mirrors a choice that he needs to make with respect to his own self, to his own identity. A weary traveler, as he arrives, he is subsequently increasingly committed to not ‘deal falsely with his self in this work he has undertaken’ (to paraphrase Winthrop’s sermon), to do right by the town and himself. Indeed it is the protagonist’s self that seems to be at stake in this mission, and if we look more closely at the symbols and structures, it’s easy to see that it all revolves around him. The protagonist is, which we haven’t mentioned yet, an African-American, and the fate of the black town that turned into a white corporate town, is, in some ways, his fate as well. He rose quickly to the top, didn’t suffer any discriminations and would fit well into the select group of Black Republicans. He’s the ‘Black friend’ all racists seem to be able to marshal in a matter of minutes. He has dedicated his life to camouflaging things, making them look and sound attractive. It’s no surprise that he, in his detached, highly ironic voice, mentions the marketing campaign for the adhesive bandages in passing at best, that is to say the brilliant idea of making colored bandages. Whitehead offers us one of the most frequent examples used in Whiteness studies, the normative use of words like “flesh” in phrases like “flesh-colored”. “Whose flesh?” a savvy ad man asks. Whose flesh indeed. And so, the company starts to produce bandages in all hues and colors, so that everyone can have a flesh-colored bandage. The hues are so well done that the bandages are no longer conspicuous upon the injured body. You can forget you were ever injured, Apex, as the bandages are subsequently named, “hides the hurt”. This is the insanely successful slogan that Apex runs on and they go on and sell huge amounts of bandages, targeted to minority groups and the poor in general. There is more to this, of course, than just a curious story about marketing and a plot device. In the story, people lose their toes because they forgot the toe was injured because the bandage hid the hurt. I read this as a reference to cosmetic politics that make things seem sound and proper, when they are actually not. What the right disparagingly calls “political correctness” and which is actually nothing but respect for your fellow men, is used, in many cases, as a cosmetic tool. As if racism went away, if we just call people by better names. Cosmetic politics, if we look at newspapers and polls, often make people believe we are living in a post-feminist, post-racial age, and any complaint about discrimination is suddenly reactionary, backwards-looking. Leave the past alone! 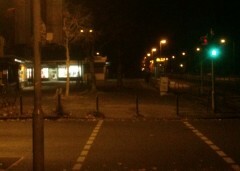 Germans whine, we are enlightened now, don’t you see, we have days of remembrance. How dare you! They howled as Holder, Attorney general of the US, called his country “a nation of cowards”. But below these bandages, these nice-sounding names and offices (a black president! How’s that for Apex?) hide the rot. Understanding the town, and understanding yourself, in Apex Hides The Hurt, means looking below the surfaces, looking at the rot. There are those who believe that to be too critical is inconvenient, almost a character flaw, but Whitehead’s point is: it’s necessary and urgent! Things that rot eventually die off and may maim the rest of the body. In one of the most fascinating tensions in the book, though, this urgency does not translate into urgent writing. On the contrary. The writing, as I said, is predominantly ironic and detached. The writing is very deliberate, but cold and frequently almost dull. This is not Auster’s ‘dull’, this is an aesthetically thrilling ‘dull’ because these sentences betray the art with which they have been constructed. There is a stiffness, but it’s also the protagonist’s stiffness. He is used to look down upon people, to dismiss them and their petty issues. Hence also the fact that all kinds of interesting and important issues come up but they barely make a dent in the narrative. These things are just not significant for the protagonist or rather: not yet. The style and, at the beginning, the ubiquitous witty stories about brands and re-brandings, are, partly, a satire of consumerism and advertising. But that’s a surface phenomenon, it’s the Apex. Below this surface, the protagonist’s true hurt hides, and as the book progresses, it breaks through more and more, without ever completely exploding the surface. The style, and the ad culture it signifies, is important in yet more ways: while racism is frequently regarded as a purely political phenomenon, Whitehead, in this book, proposes that economics might play an important role in the establishment of repressive societies. Winthrop, in this book, is not a politician, he’s an entrepreneur and he exerts economic pressure to make Goode and Field change the name of the city. Or the matter of the normative power that Band-Aid, the leading adhesive bandage, exerts. Each time the book grazes political matters it deflects. I just suggested it may be on account of the protagonist’s disinterest. Another reason might be that they are, each time anew, packaged as economic situations, thus bleeding the concern and the problem from the situation, effectively ‘hiding the hurt’. But, just like any of the other suggested readings of the characters and situations in the book, this, too, is not a definite reading. Whitehead is too brilliant a writer to try to pound home one point and make everything in the book subject to that one point, that one reading. Apex Hides The Hurt is a multi-facetted romp through America, past and present, a realistic allegory that focuses on a small microcosm without ever losing sight of the broader context. You might find it boring sometimes, but you shouldn’t. This book can sustain several rereads without ever stopping to glitter with possibilities. Colson Whitehead is an awesome writer and this is a great book.